Posts tagged " investment banking "
Knight Capital Group Inc. (KCG) is based in Jersey City, NJ is a global financial services firm They provide access to the capital market across multiple asset classes to a broad network of clients. Including broker-dealers, institutions, and corporations. It started in 1990 as a market maker in equity securities. KCG recently ventured also into investment banking and asset management. Please take note that this valuation was done for special events or issues that pop-up in the stock market recently. In which Knight’s trading loss of $440M shows cracks in equity markets. The concept of enterprise value is to calculate what it would cost to purchase an entire business. Enterprise Value EV) is the present value of the entire company. On the other hand, market capitalization is the total value of the company’s equity shares. In essence, it is a company’s theoretical takeover price, because the buyer would have to buy all of the stock and pay off existing debt, and taking any remaining cash. Market capitalization is trending at 4, -1, -6, -14, and -13 percent from 2008 to 2012 TTM. Average of -6 percent. Enterprise value is trending at -8, -0.3, 12, -13 and -1 percent from 2008 to 2012 TTM. Average of -22 percent. Price dropped to 74 percent in the trailing twelve months. The Net Current Asset Value (NCAV) is a method from Benjamin Graham it is to identify whether the stock is trading below the company’s net current asset value per share. Specifically two-thirds or 66 percent of net current asset value. Meaning they are essentially trading below the company’s liquidation value and therefore, the stocks are trading in a bargain, and it is worth buying. Market price was 74 percent average over the 66 percent of the NCAVPS. This means that the price was overvalued using market capitalization per share. 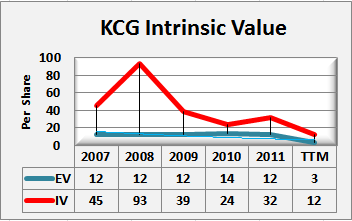 This indicates that the stock of KCG was trading above its liquidation value from 2007 to 2012 trailing twelve months. Therefore, it did not pass the stock test of Benjamin Graham. In the trailing twelve months, the company’s net current asset value was negative since current liabilities is greater than current assets. Another stock test by Graham is by using market capitalization and dividing it to net current asset value (NCAV). The idea is, if the result does not exceed the ratio of 1.2, then the stock passes the test for buying. The results above showed that the ratio was over 1.2 from 2007 to 2012 trailing twelve months, meaning the stock of KCG is trading at an overvalued price. Therefore the stock of KCG did not pass the stock test of Benjamin Graham. Graham called it the intrinsic value. According to Graham, the investor should invest only if the market price is trading at a discount to its intrinsic value. Value investing is buying with a sufficient margin of safety. Graham considers buying when the market price is considerably lower than the intrinsic or real value, a minimum of 40 to 50 percent below. The enterprise value is used because I think it is a much more accurate measure of the company’s true market value than market capitalization. The margin of safety represents 73 percent average of the real value (intrinsic value) and the price represents 27 percent average of the real value. This showed that the price is undervalued by an average of 73 percent. The formula for Intrinsic Value. The earning per share (EPS) in the trailing twelve months was adjusted from 1.10 to 0.increaseincreasing in the number of shares of 260 shares, totaling to 355 shares (95 + 260) for TTM. The intrinsic value was then recalculated which resulted in a decrease in value by $16. (from $28 to $12). Moreover, the enterprise value per share represents 32 percent average of the intrinsic value. It means the price was undervalued by 68 percent against the true value of the stock. The graph shows that the intrinsic value was greater than the price by 68 percent average, therefore, the price was trading at the undervalued price. Meaning the price was cheap. 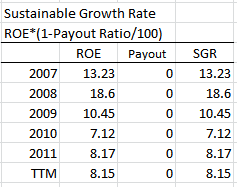 Considering the growth of KCG from 2007 to 2012, I calculated the SGR using the relative ratio and the average ratio and compared the results. It shows that intrinsic value and the margin of safety have higher results. The table below will show you the difference. It shows that using the average ratio in calculating the growth of KCG, resulted in favorable intrinsic value and margin of safety. The result is the average for 5 years. The concept of relative valuation methods for valuing a stock is to compare market values of the stock with the fundamentals (earnings, book value, growth multiples, cash flow, and other metrics) of the stock. The price was undervalued from 2007 to 2009, and it was fair value in 2010 and 2011. This is due to an adjustment in the earning per share (EPS) during the trailing twelve months for the increased in stocks by 260 shares. With this comparison, we consider the company’s growth from its five years of operation, the results were greater than 8 and 6 percent of the price to earnings and P/E*EPS, respectively. The use of this ratio is to separate price and earnings in enterprise value. And by dividing the enterprise value to projected earnings (EPS), the result represents the price (P/E) and the difference represents the earnings (EPS). The table showed that Price (P/E) represents an average of 81 percent; while earnings (EPS) represents 19 percent average. This means that it will take 4 times of earnings of the company to cover the cost of buying or in other words, an investor will wait four years to cover the costs of the purchase price. The stock price was trading at an overvalued price when pertaining to the results of Graham’s valuation method. Which are the NCAVPS and the MV/NCAV valuation. As a result;t, the stock was trading above the liquidation value of the company. Therefore, it did not pass the stock test of Benjamin Graham. The margin of safety indicates that the price was undervalued by an average of 68 percent. In the trailing twelve months, the price was undervalued by 75 percent. In other words, the price was cheap.Using the average ratio in calculating the sustainable growth rate, the intrinsic value and the margin of safety represents 42.5 and 72 percent, respectively against 40.66 and 68 percent using the relative ratio. The relative valuation method shows that the price was undervalued from 2007 to 2009. Moreover, the earning per share (EPS) decreased to $0.46 from $1.10. Due to an additional 260 shares totaled to 355 shares in the trailing twelve months. While the EV/EPS showed an overvalued price because the price represents 81 percent. And the earnings represent 15 percent of the enterprise value. 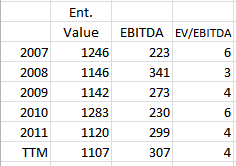 In TTM, the price is 100 percent and 0 percent earnings due to the adjusted EPS. Buying the entire business of KCG, an investor will wait 4 years to cover the costs of buying. In other terms, it will take 4 times the earnings of the Knight to cover the purchase price. Price to date, 8/15/2012 was $2.99 at $301.0 market capitalization. The stock was trading above the liquidation value of KCG, in other words, the stock was overvalued. And the stocks did not pass the stock test of Benjamin Graham. The margin of safety indicates a 77 percent average and in the trailing twelve months. Moreover, it has a 75 percent margin of safety, meaning the price was cheap at $2.99 per share. 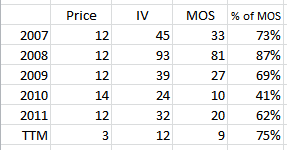 On the other hand, relative valuation shows an overvalued price for P/E*EPS. 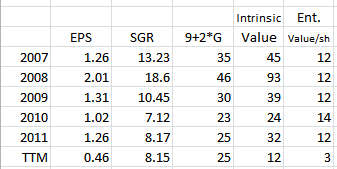 And the EV/EPS valuation. Because the price represents 81 percent. There was a margin of safety of 75 percent in the trailing twelve months meaning, the price is considered cheap at $2.99 per share. Further, Graham would take the opportunity to buy stocks if the price was lower by 50 percent of the intrinsic value. Thus he considers the stock trading at a discount price. So, I recommend a BUY in the stock of Knight Capital Group Inc (KCG).